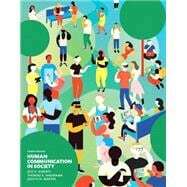 by Alberts, Jess K.; Nakayama, Thomas K.; Martin, Judith N.
Human Communication in Society, Fourth Edition is also available via REVEL™, an immersive learning experience designed for the way today's students read, think, and learn. Jess Alberts is the President’s Professor in the Hugh Downs School of Human Communication at Arizona State University. She is an interpretive scholar who focuses on interpersonal communication and specializes in the study of conflict. Thomas Nakayama is a professor in the Department of Communication Studies at Northeastern University. He is a critical scholar who focuses on rhetoric and intercultural communication. Judith Martin is a professor in the Hugh Downs School of Human Communication at Arizona State University. She is a social scientist whose expertise is in intercultural communication.